On this date in 1840, a valet was hanged at Newgate Prison for the murder of his aristocratic employer, Lord William Russell. This celebrity murder of a former Member of Parliament, septuagenarian patriarch of one of England’s august noble houses, by a member of his household activated all the crime-panic circuits still familiar a couple centuries later. That of class, of course: the perpetual frisson of animosity between the respectable and those they held in economic servitude, bursting bloodily onto the front pages. That of foreignness, since Courvoisier was Swiss. The valet was quickly on trial for his life; the total time elapsed from Russell’s death to Courvoisier’s own was two months to the day. But a less hasty schedule might have permitted better investigation, as Courvoisier was well on his way to acquittal with his lawyer’s deft rebuttal of the crown’s entirely circumstantial case. When police discovered the decisively damning evidence of Russell’s stolen effects midway through the trial, the Swiss man made himself an milepost in the evolution of professional ethics at the bar. Summoning his lawyers, Courvoisier informed them that he was indeed guilty but that he had no intention of pleading guilty to a hanging crime and expected his defense to continue. Among the published broadsides are several popular ballads relating to the case — one written to lament the murder, before the apprehension of a suspect; others for the condemned’s execution. One certainly wouldn’t call these great literature, but they’re representative examples of broadside balladry, nearly de rigueuer for scandal-mongering Victorian crime coverage and therefore very relevant for these pages. I, alas! repent too late. My heart’s so full of grief and woe. Did I embitter their fond days. This world for a long Eternity. And well he did deserve the same. One that was so good and kind? Me, that I may mercy find. Alas! my days they are all numbered. All, take warning by my fate! 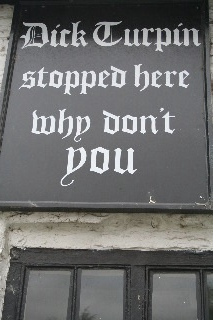 Or you’ll repent when ’tis too late. Act upright — be just and true. And brought me to this untimely end. None whatever knew but me. Basely murdered was by me. 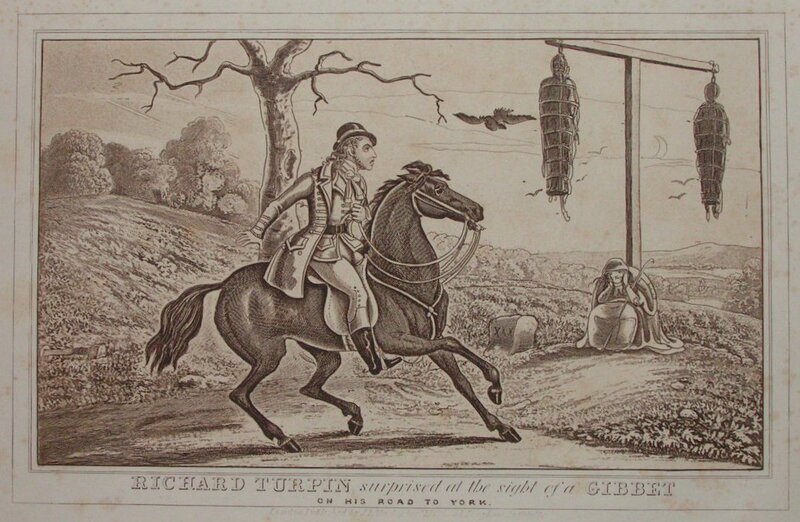 Charles Dickens attended this hanging, mining the scene for Barnaby Rudge. William Thackeray came too — he was becoming publicly engaged as a man troubled by capital punishment, and it was the first execution he had witnessed. (Actually, he turned away at the decisive moment.) Thackeray published an article about the experience in Fraser’s magazine, reflecting doubt at the salutary value of public executions and empathy with the young man’s scrambled mental state as he was raced from condemnation to the gallows in a mere fortnight. 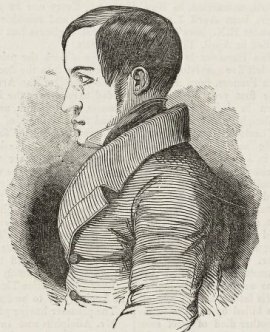 * Courvoisier’s Jack Sheppard reference triggered thunderous indictments of this text in the popular press — “a publication calculated to familiarise the mind with cruelties,” howled the London Examiner “and to serve as the cut-throat’s manual” and caused the stage adaptation to be censored (pdf). Though Ainsworth had decades of writing ahead of him, it’s been argued that his reputation never fully recovered from this case, and that’s why he’s not in the canon. 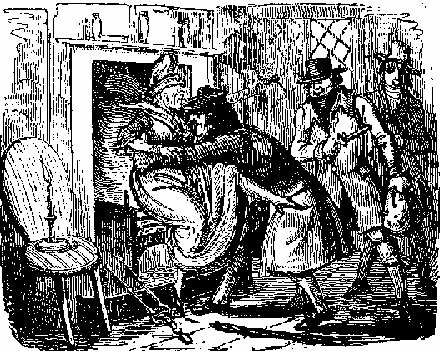 What he lacks in posthumous celebration he garnered in contemporary buzz; Ainsworth’s “Newgate novels” valorizing highwaymen helped to feed an enduring popular craze for hanging broadsides and “penny dreadfuls” and to mainstream a (commercialized) version of thieves’ cant. 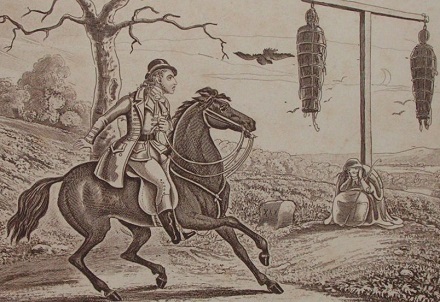 See The Hanging Tree: Execution and the English People 1770-1868. ** See The Bar & The Old Bailey, 1750-1850. In a more unctuous vein, the bishop of London submitted a petition to the House of Lords demanding repeal of the right of defendants’ lawyers to make closing statements.